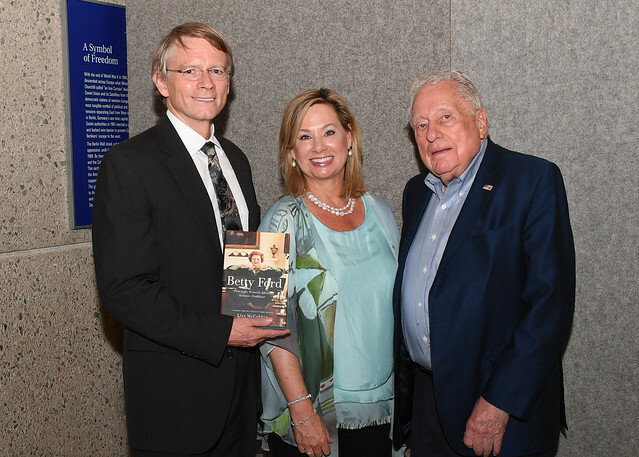 Lisa McCubbin, award-winning journalist and the author of numerous New York Times bestselling titles, discussed her new book Betty Ford: First Lady, Women’s Advocate, Survivor, Trailblazer on September 13, 2018 at the Gerald R. Ford Presidential Museum. McCubbin previously previewed her book the night before on September 12, 2018 at the Gerald R. Ford Presidential Library in Ann Arbor, Michigan. McCubbin co-wrote with Clint Hill, a former U.S. Secret Service agent, three memoirs on Hill’s remarkable career: Mrs. Kennedy and Me; Five Days in November; and Five Presidents: My Extraordinary Journey with Eisenhower, Kennedy, Johnson, Nixon, and Ford. Mike Ford, Gerald R. Ford Presidential Foundation Chairman and son of Gerald and Betty Ford, introduced McCubbin. As she began her discussion highlighting Betty Ford’s childhood background including her theory on why she was called Betty from a young age. McCubbin touched on Betty’s young life with her brothers, summer vacations, her father traveling away from home for work, and when she fell in love with dancing. It was also noted that Betty Ford’s father and brother were alcoholics. McCubbin recalled Betty’s life raising her family, while her husband traveled for his job. While in D.C., the Ford’s welcomed four children, Mike, Jack, Steve, and Susan. While raising her childcare, McCubbin recalled the story of when Betty was diagnosed with a pinched nerve which she was prescribed with painkillers, and thus began her dependency on pills. After years in Congress, Gerald finally promised Betty he would not run for re-election and, they would move back to Grand Rapids at the end of his next term. Richard Nixon easily won his re-election for President but his Vice President would soon resign. Nixon appointed Gerald R. Ford as his Vice President. And in just a year Gerald R. Ford would become President of the United States when Nixon resigned, thus propelling Betty from a Congressman’s wife to the nation’s First Lady where her trailblazing ways would shine brightest.